A few years ago, Jennifer Dewalt did a project where she created 180 websites in 180 days, one every day for half a year, to learn how to program. These "websites" were actually web pages within one website, but the plan and the execution were still quite amazing. I watched on and off as she created page after page, learning all about web development in the process. One page in particular caught my interest: the simple game called Color Walk. 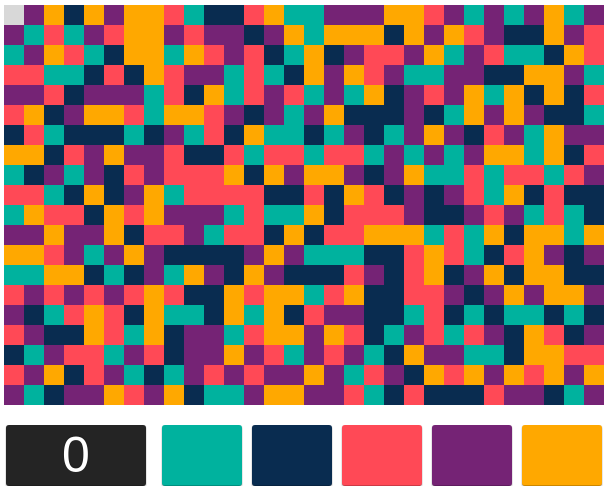 In this game there's a 20x30 grid of colored blocks in five different colors. The top left block is blank, and there are five colored buttons to choose from. Click a button, and the blank space will expand by removing the adjacent colored blocks corresponding to the button clicked. The goal is to clear the board in as few clicks as possible.